Mary is the mother of a dear friend. She is a brilliant cook, a masterful orchid-grower and a complete delight to share a bottle of wine with. She is also a self-taught knitter—and an amazing one at that. For Christmas she knitted me a wonderfully soft snood and this week I was gifted an adorable beanie (with sequins, no less!!!). I’m ready to ditch the winter duds, but until spring comes, this little woolie will give my step some pep. I am over the moon for this hat—did you know about my love-affair with sequins? The pink and grey combo is so perfect too. It is a tiny bit big (I heard you were concerned) but I kind of love that. It has this floppy effect that I find particularly charming. I’ve been wearing it all over town with a little skip in my step. 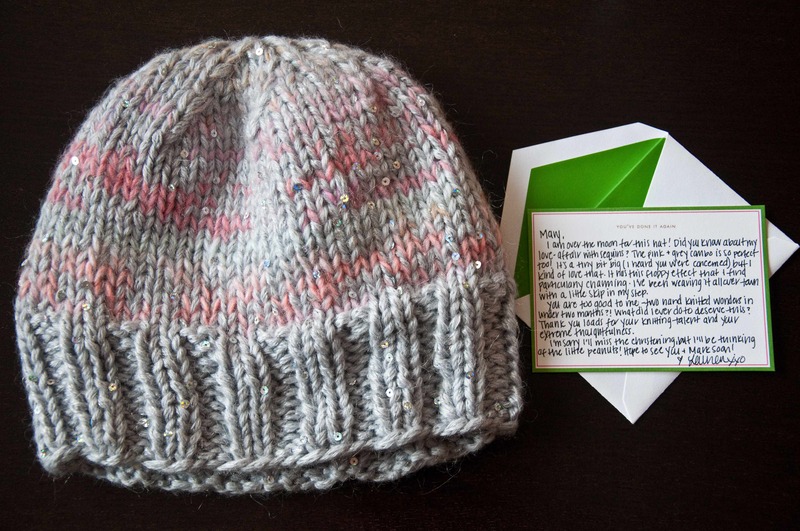 You are too good to me—two hand-knitted wonders in under two months?! What did I ever do to deserve this? Thank you loads for your knitting talent and extreme thoughtfulness. I’m sorry I’ll miss the christening, but I’ll be thinking of the little peanuts. Hope to see you and Mark soon.